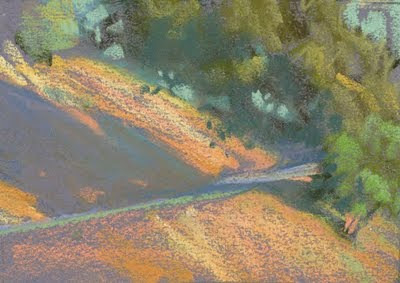 I recently finished teaching 2 more pastel classes at work. 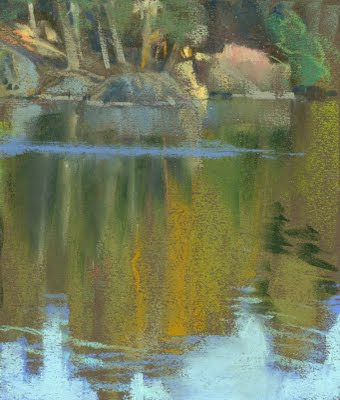 I teach an 8 session course to about 20 students at a time, so for a month I had 40 students total to incite, badger, and cajole into experiencing the challenges and rewards of studying natural light. I enjoy it very much and, as a teacher, I learn new things each time, about light and teaching. The first 2 class sessions were held indoors with some lectures, exercises and demos. After that we headed outside, where natural light and circumstances prevail. 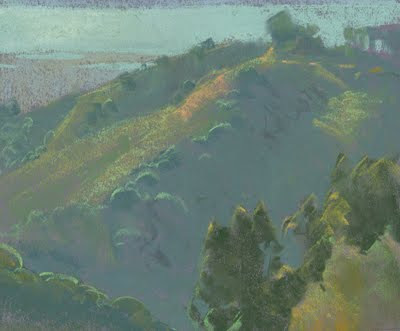 The outdoor sessions were generally held in the Berkeley Hills above Emeryville and Oakland, with the goal of painting the same locales in the morning hours and the late afternoon, to observe the dynamic shifts of color, value, and light. Part of my regimen in the class was to set up at a given locale and start a piece, so students could watch me work, or elect to start their own if they desired. I always had a few folks peering over my shoulder while doing these pieces, but it wasn't a full on demo where I would verbally announce all my thoughts and strategies to a large group. That sort of display I have yet to master. These were more relaxed studies with a few onlookers, who may or may not be asking questions. Less stressful... more nutritious! The classes were a pleasure to teach. 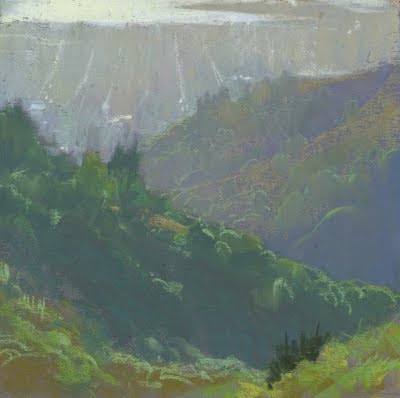 People from work are pretty motivated to learn, and a class that gets one out of the office and up into the hills to paint is a fairly healthy way to spend time. While we were fogged out of spots on more than one occasion, we generally had good results with the weather, and witnessed some spectacular shifts in light between dawn, sunrise, all the way up to sunset and dusk. 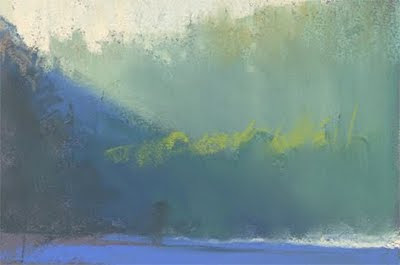 A caveat with all these pieces is that they were all painted as studies or demos within the context of a class, and I often stopped working on them somewhat prematurely to spend the remainder of my time making the rounds with students, discussing and assisting them in their work. In that regard, I probably managed to avoid overworking anything, though some are rather abbreviated and 'pedantic' in my opinion. Further comments below. Probably the most 'pedantic' of the bunch. By that I mean that I was very conscious about the relative values and the attention to atmospheric light, topics I'd been pointing out in lectures and one on one discussions. Subtleties? 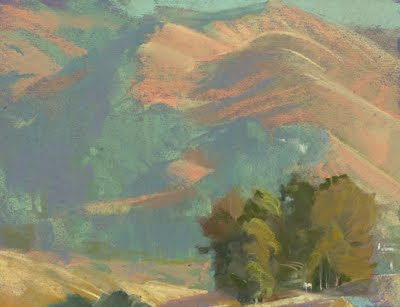 Like the briefly indicated 'deeper' shadows on the hillside in the midground? Yes, some cursory indications were made...then time to make house calls! 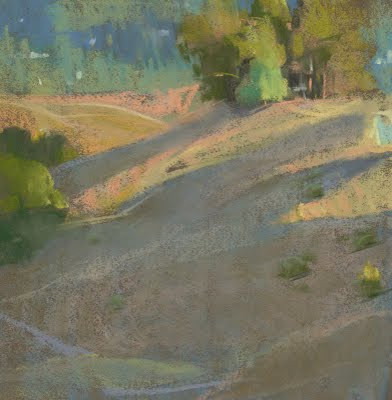 I did some quicker small studies to try and represent very ephemeral, intense atmospheric light and extremely warm, direct light slamming into the hill next to me right before sunset. The light is visibly changing by the minute at times like this. Done on a different afternoon than the first piece. There was an enormous glare on the bay from the late afternoon sun. That is the Berkeley Marina angling in on the right. These top 4 pieces were all painted from a turnout on Grizzly Peak Blvd. right before and after the sun came blasting into the lake basin. These are clear examples of the shifting range of color that is going on around us continuously. 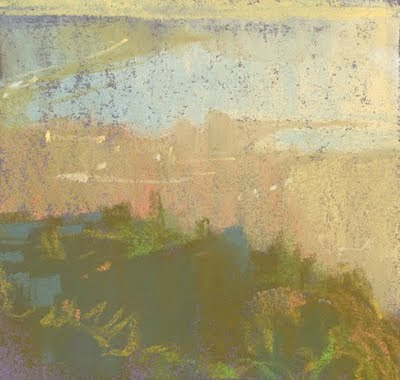 Mulholland Ridge in Orinda is a good bailout point when the fog comes too far into the bay, as it lies a few miles east of the Berkeley Hills. The images above are both afternoon/evening demos done on different days. The grove of trees in the top of the first image is the same grove that is in the bottom of the second. The color of dead grasses in shadow is always one of those interesting challenges, as it presents a warm local color that is being hit by the cooler ambient light of the sky. So, is it warm, or is it cool? A great paradox to bedevil students with! The answer is that it is cooler than the lit portion, and likely warmer than something that has an inherently cooler local color that may be enveloped in the same shadow! In addition, the shifting folds and planes of the hill play a role in how cool or warm they are relative to each other, as some parts 'see' the sky more than others. 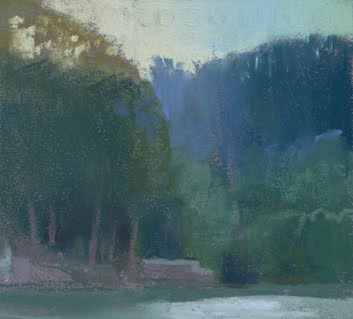 The light on these 2 days was markedly different as there was quite a lot of high altitude clouds and haze the afternoon the second piece was painted, which lent a rather pasty, pale aspect to the atmosphere. Even though the sunlight was quite warm, colors were not as vibrant overall. In looking at the bottom image, I can also note in hindsight that some of my distant 'warm' shadows are too warm, and jump forward as a result. This student still has plenty to learn!